2K Games has posted a BioShock 2 multiplayer FAQ, revealing that the game will not support dedicated servers or LAN play but will use a "worldwide leaderboard" and matchmaking system to get players into the action as quickly as possible. One of the big giggles in the upcoming BioShock 2 is the addition of multiplayer support, a feature that was absent in the original. Existing separately from the single-player story, the multiplayer action in BioShock 2 is set prior to the first game, with players as splicers fighting in a civil war that's wracking the underwater city of Rapture. How it would actually function was a bit hazy, but now a BioShock 2 Mulitplayer FAQ has been posted at the Cult of Rapture that clears up a lot of lingering questions. First and foremost, there will be no LAN or dedicated server support. "There is always a finite amount of time for the development of a game. Bringing multiplayer to BioShock was a daunting task between the tech (there was no multiplayer support in the codebase from the first game) and the expectations of the community," wrote 2K Games Community Manager Elizabeth Tobey, better known in some circles as 2K Elizabeth. "Either you try to do everything and so nothing feels finished or you focus your efforts to do a smaller number of things really well like an accessible online experience. We chose to spend the time we had creating a solid game foundation and unfortunately that did not include LAN play or dedicated servers." It also doesn't include the option to kick jerks and troublemakers out of matches. "There is no kick option as we felt like it often leads to more unfair kicking than fair kicking," she explained. "We hope that because there are a variety of player goals and a multitude of options for ranking up and killing, the player will always feel like he or she is gaining something in a match with mean people and griefers. If you do get matched up with one of those people, please report it, leave that game, and we'll try to smooth out the online experience as best as we can." Separate ranked and unranked multiplayer matches won't be supported; players will be able to create private, invitation-only matches for up to ten people as a way to practice without affecting online rankings but otherwise, everything will be recorded on a worldwide leaderboard, while an "in-game party system" will let players invite up to four others into a party for online matchmaking. "The matchmaking system will keep you and your friends together on the same team as long as you all want to play together and will attempt to find you players of similar skill for your party to play against," Tobey wrote. "We try to get you into a game as quickly as possible (since we know how much waiting really stinks), but match you up to people who are as close to your rank and skill as possible, with a certain amount of weighting to each factor, as well as requiring a low ping for those matched players." The online support for BioShock 2 has always struck me as a tacked-on afterthought, a half-assed sop for gamers who reflexively believe that everything is better with multiplayer. On a personal level, then, I couldn't care less about any of this, but if I was interested in becoming a splicer-soldier, I think I'd be disappointed. Maybe it's a reflexive belief of my own - everything is better with dedicated server support - but if I'm going to play online, I want control over where I play, who I play with and, just as important, who I don't play with. This FAQ clears up a lot of questions, but it doesn't do much to sell me on the game. 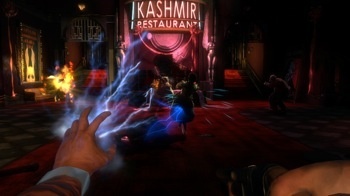 BioShock 2 is slated for release on February 9 for the Xbox 360, PlayStation 3 and PC.